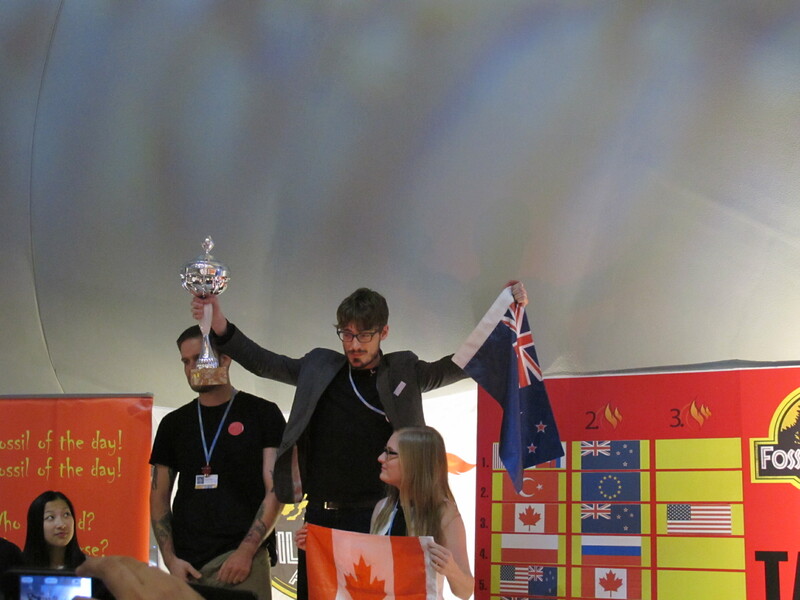 New Zealand Youth Delegate Simon Tapp with our golden prize: a Colossal Fossil, shared with Canada. At the end of every UNFCCC meeting, on the last day, there’s a grand prize: the Colossal Fossil. So proud: New Zealand took top prize for the first time, shared with Canada. For a country whose emissions are similar in scale to the Canadian tar sands, New Zealand has demonstrated exceptional blindness to scientific and political realities. Surprising many and disappointing all, New Zealand has fought hard to unseat 5-time Colossal Fossil winner, Canada, in a campaign of extreme selfishness and irresponsibility. While New Zealand may have helped drown the talks for another year, New Zealand’s small and vulnerable Pacific neighbours should take heart that they have not been forgotten – New Zealand intends to drown them too. I don’t think I can add much to this, except to say that for a small country, we sure manage to punch above our weight at these talks, upsetting more governments and people than is warranted for our small size. Sam from the Youth Delegation has summed it up nicely over on the youth blog. It’s all about trust. I was going to write a light-hearted blog today, poking fun at Lord Christopher Monckton’s appearance in Doha, in his Arabic dress and antics in the plenary. But I thought about it overnight and woke this morning more angry about it than amused.Monckton turned up on Wednesday dressed in full Arab regalia – the long, white kheffiyeh that the majority of Qatari men wear every day. He held a press conference the next day with the Committee for a Constructive Tomorrow and a Texan tea party group, with Republican Senator James Inhofe joining by video. But this week saw a massive typhoon in the Philippines that has so far killed more than 500 people – and counting. The southernmost super-typhoon ever seen in the country. It nearly wiped out Palau altogether. Later, Monckton later took the floor in the plenary, posing as a delegate for Burma, who don’t have a delegation here, and told the meeting that there had been no warming in 16 years. The whole plenary booed him. He had his badge taken off him, and was ejected (he was leaving anyway). The Guardian Liveblog covered it here, if you feel you must watch (another rant from me there too). So that’s it. Never again will I see the Viscount of Brenchley, Lord Christopher Monckton at a climate talks. Good riddance. He’s already trying to spin that he was thrown out because he was talking about no warming for 16 years, when in fact he was rightfully thrown out for speaking on the floor as Burma when he wasn’t entitled to do that. Right now, it’s after 2 am and I’ve left the negotiations to get some sleep. There’s big deadlocks around a lot of the detail, with much focus on an incredibly weak Kyoto Protocol text. Who’s in, who’s out? Our government has been right in there, weakening rules around trading to the point that they’re actually weaker than they were in the early 1990’s. Then there’s the issue of “loss and damage,” new to the discussions from last year. The key sticking point is over whether there is an international mechanism set up to help distribute money for the poorest countries to pay for the loss and damage from climate impacts. It’s about the industrialized world paying for the damage it’s now wreaking on the poorest. This isn’t going to finish any time soon. What we’ll get tomorrow is up in the air, but what we do know is that air will continue to be filled with increasing amounts of C02 – and nothing that’s happening here is going to slow it any time soon. I’ll know more in the morning, but bets are on that it’s going to last through to late Saturday. Who decides the winners of the fossil awards? A bunch of people hopelessly out of touch with the pulse of the negotiations, uninvited to working groups, and relying on superficial historical and unsupportable garbage for their grandstanding judgements. Password – I know your comments are designed to deflect attention away from this issue – but very bad things have now been set in place by the human-caused release of carbon dioxide into the atmosphere. Burning ever more carbon-based fossil fuels will only make things worse, and New Zealand will not be immune to these negative consequences – the intensified rainfall anomalies associated with La Nina/El Nino will perhaps be the most obvious as the world continues to warm. Now it is true that this political process has so far been a total flop. Ever since these meetings began CO2 emissions have continued to accelerate, which simply means more pain and suffering in the future. But by not even making symbolic gestures, by refusing to even consider reducing greenhouse gas emissions, this National-led government is leading us down the path to wrack and ruin. Nope, just with the providers of inadequate analysis and with their sheepish, slavish, blinkered followers. The irony of this comment is painful in the extreme. When you complain of inadequate analysis, I take it that you are complaining that the other posters and commentators here are unconcerned with the economic nuances of a global carbon market. That we do not see just how difficult it is to construct a ETS with all its pro’s and cons, and how can we manage an economy that continues to provide the growth that we need to maintain our current standard of living, – or something like that. I’m sure you will be able to express it much more eloquently than I. The sheepish, slavish, blinkered followers are in fact those ‘economists’ who still place their trust in the role of a market and the so-called “laws” of supply and demand. It is they who are the providers of inadequate analysis, for all their pronouncements are based on false assumptions and wrongheaded reasoning. It is these high priests of governance who are as much the stumbling block to progress, as much as any denier. No, I was referring to the organisers of the fossil awards, but thanks for the sermon. I take it then that you are in total agreement with the gov’ts actions and stance on climate change; and that as a consequence, in your opinion, NZ has nothing to be ashamed of? Despite the fact that NZ was an early signatory to Kyoto and the fact that at least 26 other developed Nations including Australia and the EU have agreed to a roll over. (not that the existing agreement is anything to shout out about – but better than nothing which is where NZ effectively places itself at the moment.) Oh yes! I hear all the other waffle – it doesn’t matter anyway etc etc. But you are seriously wrong. NZ’s contribution maybe small but it is not insignificant from a symbolic point of view. We have consistently boxed above our weight in the past. This new direction in policy to one of self interest and lack of care for those who will wear the brunt of climate change is what brings about this shameful award. all to happy to discuss abstract issues like wind energy efficiency and ice densities, but no one wants to engage on hard policy like the life of CBDR (common but differentiated responsibilities), whether or not a low unit price is a good or bad thing, how a carbon tax would apply to agricultural emissions and forestry sequestration, the societal and economic benefits of industrial allocation etc etc. I’ll out it bluntly: as D’oh!a illustrates only too clearly, people like you are in no danger of ever achieving anything, beyond the inadvertent. (See, I can be rude, too.) So, cool your heels, pull your head in, and don’t be knocking the young folks in the NGOs just because they offend your sense of ‘right’ social-hierarchy. If you sincerely want to discuss these matters you’re going the wrong way about it so brazenly that the obvious conclusion to draw is that you do not wish to do so. So I suggest you either prove me wrong or take a hike. You’re happy to condemn climate science deniers for falsehoods and superficiality, but equally happy to assume the analysis of the fossil award organisers is robust and accurate and not necessary to challenge. That’s biased, blinkered and inconsistent. Your thoughts on what I think NZ’s domestic policy should be are totally wrong as well as irrelevant. Just saying something is ‘totally wrong’ doesn’t make it so. The obvious ethical point of this argument – NZ refusing to pull its weight at the international level – has been put to you repeatedly, and your ignoring it won’t make it go away. Neither will bloviating about obscure accounting rules as if that was the indispensible core of a real way forward. The Climate Action Network is composed of activists! By definition. Not glorified CPAs. They’re not finessing, fiddling, or finagling the books in order to make night into day, up into down, or pork-abattoir surplus into a fine line in chic silk change-holders perfect for that business brunch or evening networking soiree; they’re acting! They’re trying to make a bloody point! This is a species you would no doubt find it very hard to relate to, but as an activist who has actually had a good number of successes – being the mining industry turfed out of about 700 000 hectares of my home state in 4 separate campaigns to date – I can assure you that one does not achieve anything at all by taking ‘responsible’ advice, or pandering to ‘respectable’ sensibilities! In fact, attracting the indignation of such is an indicator that you’re well down the right road. Seriously. Those that train campaigners even teach that. hehe that comment, password1, shows your ignorance of the process. The Climate Action Network has people in every single meeting – they have a more comprehensive overview of the meeting than any other network, and a daily meeting that assesses the entire process. It’s at those daily meetings that a range of potential candidates for Fossil of the Day are put forward and voted on. pretty much. Of course there’s some bilaterals they don’t get into. Many government delegations have NGO’s on their delegations, so they get “pink badges” (ie govt badges) and are therefore in the heart of the negotiations, with access to meetings that NGO’s and media don’t. Including most of the informals and the like. (Of course the only NGO New Zealand has on its delegation is Business New Zealand). As a result of all of this, CAN has very good access to intelligence about what’s going on behind all those closed doors. This is a supreme moment of shame for us as a country. I am at a loss to describe how saddened I am that NZ – once leaders in Social Welfare, Social Justice for all, and doing right for all humanity, is now a Pariah State – the snake in the grass, the unwanted guest. We care not for our children, or those in poverty, and we care even less, for those who live beyond our shores. This is a disgraceful “government” and the sooner they are gone, the better. As a Brit, I am extremely proud that the uk has decided to give 2 billion pounds of money that it doesn’t have, to help the Africans build windmills that it doesn’t need. @andyS The money is not new money but is already budgeted for and is spread over several years. I agree that African countries don’t need “windmills” but wind turbines and solar systems to provide renewable energy would be really important assistance. Low-carbon rural electrification is a positive way forward. Looks like most of these so called climate funds to Africa are ending up in corporations pockets, like Walmart. Whatever the truth of this – and one needs to remember the old question ‘is that true, or did you read it in The Telegraph?’ – you’re acting in bad faith. You don’t give a tinker’s cuss about the poor in Africa, their long-term survival and their energy needs, you’re just playing the wrecker, using this as yet another attempt to undermine renewable energy. Also, the idea that because something goes awry in a program this constitutes an argument for terminating the entire program is like saying that the various false-arrests and wrongful convictions our nations perpetrate each year mean we should do without a police force or judiciary. What do you know about me and what I donate or do otherwise for the people of Africa? What business is it of yours anyway? What do you think happens to the majority of aid money that it destined for Africa and elsewhere? Do you think it ends up helping the malnourished and those without fresh water to drink? Or do you think it ends up in a Mercedes dealers pocket, or perhaps in tarting up the president’s swimming pool? In the week before Doha, a local Qatar poet was sentenced to life imprisonment for critising the government there. Where were the boycotts, the protests? Did anyone stuffing their faces with canapes at the various group hugs bother to even register this on their conciousness.? Ditto what Macro wrote. A disgraceful “government” indeed. it’s even worse this morning. There’s a declaration at the end of the KP text that has Australia, EU, Japan, Lichtenstein, Monaco, Norway and Switzerland signing an agreement that they will not trade hot air. We are pretty much on our own on this one. Hideously embarrassing. You mean hot air AAUs Cindy? Specifically Polish AAUs? I think you’re being misleading. AAUs are not used in the NZETS, and as Nz doesnt need them for a second commitment period, why should NZ care? For readers interested in a more rounded discussion of the negotiations than Cindy provides, I highly recommend the guardians environment blog. That’s absolutely right P1, but at the same time Japan can’t trade them either (according to the new text). Govts will be able to use carried-over units to comply with their targets in the second commitment period and will be allowed to trade up to 2% of these. The thing is that these other countries have gone ahead and signed this political declaration as a declaration of faith , an indication that they know and understand that hot air should get out of the system, as an olive branch to developing countries that they will no longer cheat the system. We also need all the hot air to be disappeared before 2020 under a new agreement because we cannot have ANY hot air in that (even more important). NZ are being sore losers, as the new eligibility clauses in the KP text means that we can no longer rely on the international carbon trading system set up under Kyoto (after 2015). The NZ language that was in yesterday’s draft decision had everybody and their dog in the system, whether they signed up to KP2 or not. This was thrown out overnight. So read the Guardian Blog everybody (indeed, I urge you to do so) but I doubt they will explain the New Zealand situation. On a positive note, it was a delight and a privilege to spend the weekend with my daughter and 700 other young people at the Powershift conference in Auckland. This is exactly what we need right now; a mass movement of climate activism to challenge the entrenched “business and usual” power elites whose inertia and greed threatens all our futures. Make the negotiators at Doha sit up and take notice. Massed lines of uniformed, chanting automatons- eyes glazed with the certainty of their cause. All prepared to sacrifice others’ wealth, health and freedom to rid the world of a contrived evil. This is far more disturbing than any fossil fuel you could name. The Return of The Dud! Steve, if you and your fellow denialists can’t lead, or follow, then get out of the f***ing way, because we are not going down without a fight on the defining issue of this and future generations. The defining issue of this “and” future generations? Can you possibly be more preposterously presumptuous? Do you honestly believe that late this century there will still be those who belive that we will see metres of sea level rise before 2100? We’re on track for about a foot. That’s your problem isn’t it? That your grandchildren will laugh at you. Macro – even more disconcerting is that those rates persisted during the last interglacial when sea level was above present day – suggesting collapse of the Greenland & West Antarctic ice sheets when they were of similar size to present-day. The implication, of course, is that a future rapid rate of sea level rise is not only possible, but perhaps, likely. Spare me your ignorance and straw men, Steve; your grandchildren (assuming you manage to reproduce) will be ashamed of you. Steve has managed to produce a beautiful child and has also gained his degree recently, we should offer congratulations to him. Sure offer our congratulations at your next denier hui! I didn’t even know they offered degrees in Incoherent Ranting. The return of an odious troll – best not to feed it. In other words sea level rise has to quadruple, and it has to have started in 2000. The fact that your catastrophic sea level acceleration is now a dozen years overdue is one reason among many that AGW alarmism is now a busted flush. But don’t worry Steve won’t read any of it. It would test his faith too much. So the 3 mm/year we have seen since put us on track for 12 cm from 1990-2030-down the lower end of the projected range. Not alarming, and heavily favouring monitor and adapt, as opposed to shut down the global economy cos we’re all going to die. Behold! Steve is back… and ignorant as ever! Sure, can you email me details? In the meantime `Look at all my trials and tribulations sinking in a gentle pool of wine`. Otago Pinot Noir of course. Could be the best way out you know. Cher. I bet you haven’t heard that nickname in a while. Are you still a dedicated ACT Party supporter despite their moral and ethical dilemmas? This country does need a dedicated free market political party but Banks, Hide, Brash et. al. should not be a part if it. Hi Simon, you still in Aussie? And yes I still support ACT. Moral dilemmas? How can you impugn a man who is saving a baby elephant? Would you prefer campaigns were funded the Labour method: by simply stealing public money for pledge cards and then retrospectively changing the law? Ah yes, ACT, the party that believes in stealing from the poor to give to the rich… I had half a mind to join them once, but they said that made me over-qualified. Actually ACT stands for the removal of privelege, such as rewarding politically favoured ticket-clippers with an eye for the main chance by taxing everyone more for their food, and fuel. Carbon traders for e.g. So, ACT would support a carbon tax to replace the discredited and ineffectual ETS? Or do they still deny the reality of AGW? Act did actualy campaign against the ETS. The only party to do so. Now you are claiming that the ETS is discredited, would you agree at ACT were correct? the ETS is discredited b/c it’s been watered down so as to be rendered useless. That doesn’t make ACT’s campaign against it right! A political party that supposedly bases its ideology on smaller state, lower taxes, has every right to campaign against a quasi-tax (the ETS) that increases tax and increases the size of the state. Regardless or not of whether you agree with the ideology, it is politically consistent. Please post evidence that any ACT spokesperson has ever “denied the reality of AGW”. I suppose every thing that Rodney said was in jest then. Or wasn’t he speaking as a spokesperson for ACT when he was in the house? you want any more evidence? No, What RH was clearly challenging was the hockey schtick. ACT has no problem with the notion that there may be a small warming effect from AGHG, but that the catastrophist assumptions on which the agenda of global energy restrictions is based are simply not based on science. And the failure of the world to show anything more than a moderate warming or sea level rise since the first alarmist predictions were made bear this out. Still misguided and downright wrong! Nobody has an issue with you stating this as your personal belief or religion. But when you state this as FACT, you are out of order as clearly the facts are rather different than your religion! Actually, Steve, it was Donna Awatere-Huata, Rodney Hide, Heather Roy, David Garrett, Don Brash and John Banks who starred in the comedy horror film “ACT – Long Knives of the Living Dead” that was such a hit with NZ voters…. The Act Party’s current position on climate change is that there is no warming trend in New Zealand. BTW, Steve, say what you will about Al Gore, he never stole a dead child’s identity, or thieved from disadvantaged children, or lied about knowing Kim Dotcom. Actually the warmist scam of subsidising biofuels is thieving food out of the mouths of millions of children right now. Indeed, but all the “warmists” I know are opposed to unsustainable biofuels for exactly that reason. The real villains are the farm farming / plantation lobbies and the politicians they have bought. Speaking of buying politicians, is it not true that ACT’s climate denial comes from it being the creature of Alan Gibbs? And Roger Douglas was the man who removed the farming subsidies. As such he, by removing the incentives for overstocking erodible marginal hill country, did more for the environment than anyone on this site ever has. Nice red herring, Steve, but irrelevant to the current discussion. BTW, Roger Douglas quit ACT in disgust at the damage Rodney Hide had inflicted on the brand. And subsequently re-joined with Rodney as leader and served a term as MP. And subsequently quit in disgust again, along with every other sitting ACT MP. Nationwide, ACT received only 1.07% of the party vote,.. As a result, ACT were only entitled to one seat in the new Parliament, filled by John Banks. Sheesh, what are you doing with such a bunch of losers, Steve? …Act and Steve: Like minds attract each other. I am sure Banksy will be happy to have Steve W on his side since he lost Dot.Com’s friendship when not coming up with the goods Dot.Com paid him for AND denying knowingly receiving said payment. What a “Bana Republic” have we become, where a PM stands behind a sorry figure like Bank’s and his dirty laundry…. Note how any discussion of ACT turns into an-homs of various persons, rather than facing up to the fact that ACT has been right all along on the ETS. If Labour et al want to go into the 2014 election talking about the morality of funding of past elections then bring it on. Wrong: ACT has not been right on the ETS at all! ACT has denied climate change and fought the ETS on grounds of denying the need for action to combat climate change and denying that NZ must do its share. The fact that the ETS has been unsuccessful so far is caused by those – like ACT – who have done there best to water the scheme down or render it defunct. No, Steve, it’s just that the mere facts of ACT’s sordid history above are so bad that they sound like ad-homs; and that’s without even mentioning “perk buster” Rodney Hide’s hypocrisy in taking his girlfriend for a holiday on the taxpayer! Previous Previous post: The Climate Show #31: Doha! Doha! Doha!